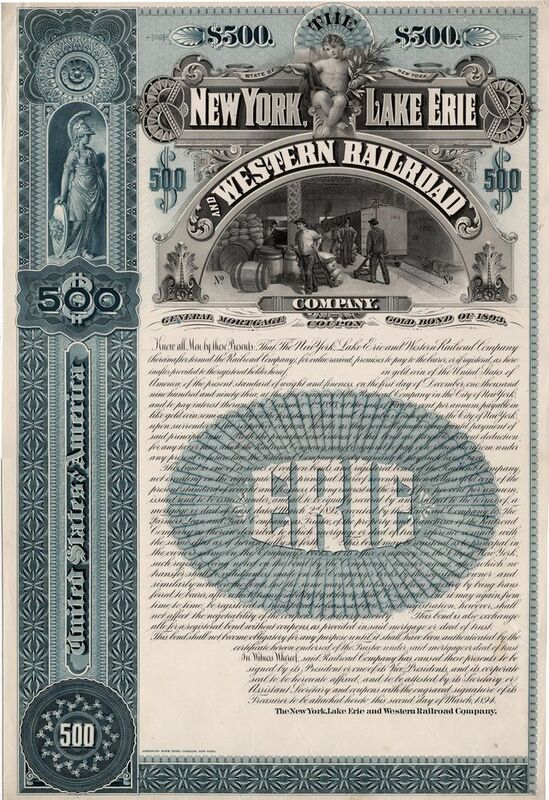 As a result of the de-acquisition of the American Bank Note Co. Archives, primarily in the 1990s, a great number of steel and copper printing plates were auctioned off and now reside in private collections. 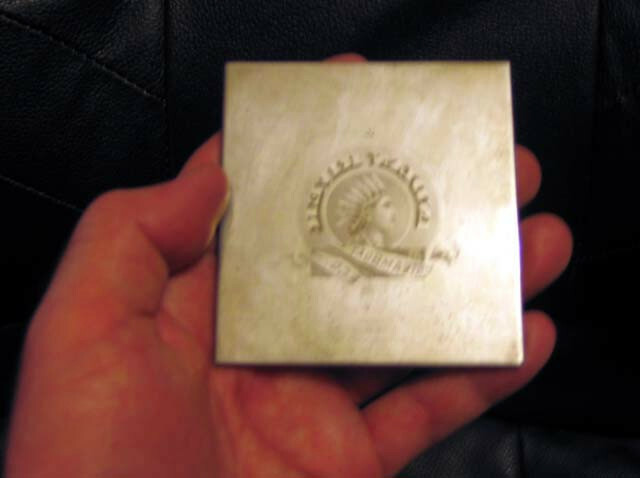 I have one small steel plate, myself. 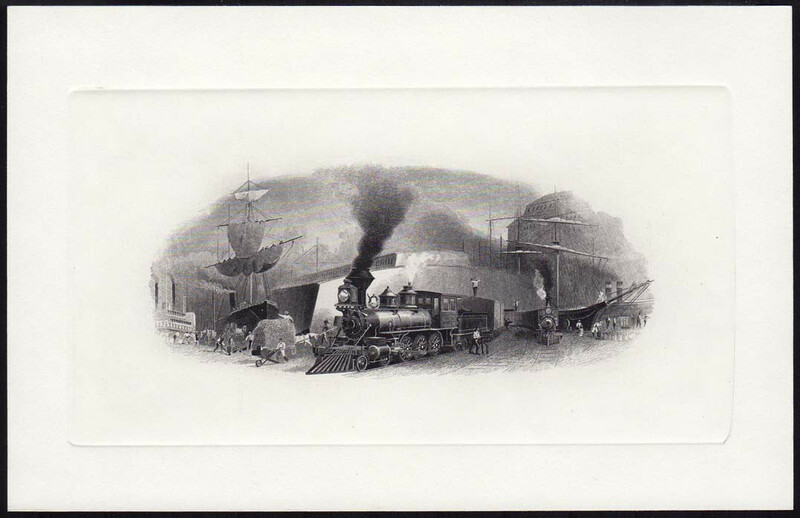 During my recent trip East, a collector friend gifted me with a lavish engraved print that he'd had printed from a large plate he'd acquired many years ago. 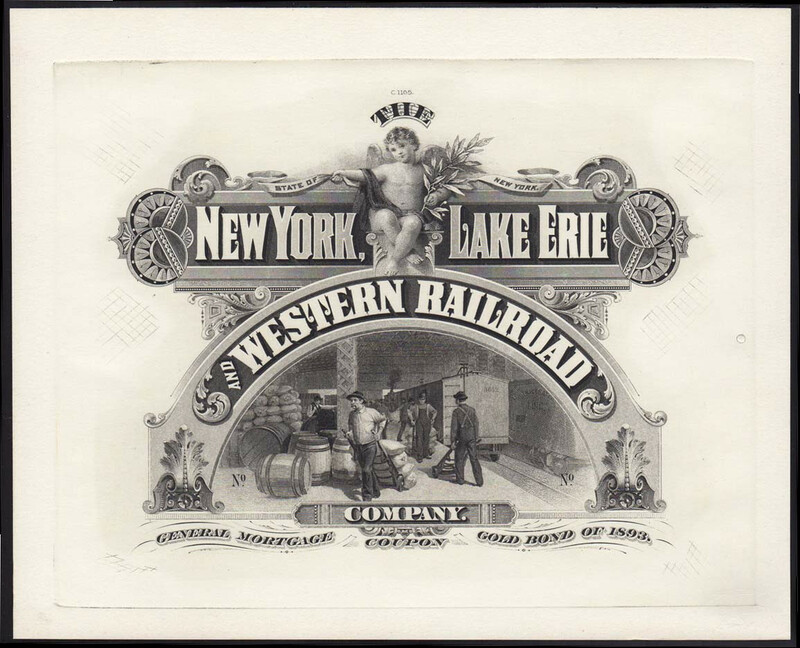 This was a header for two 1894 bonds issued by the New York, Lake Erie & Western Railroad Co. I also have print from another friend who had it made from a transfer roll. 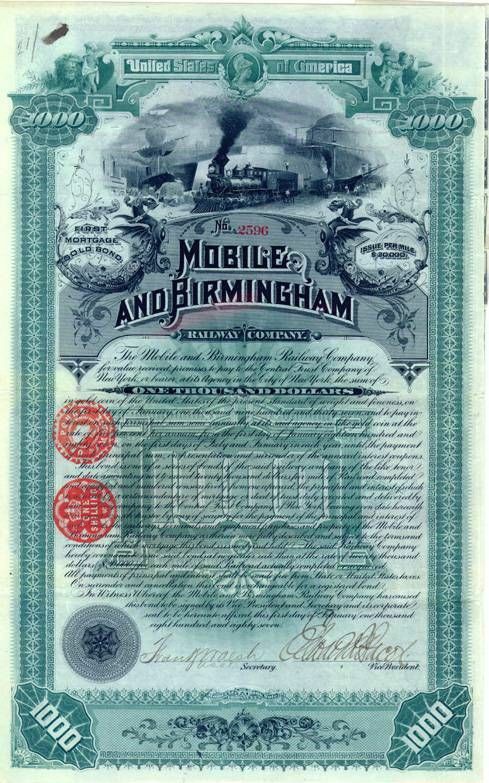 This was originally engraved by the Homer Lee Banknote Co. for a Mobile & Birmingham RR bond, and it appears on other bonds as well. I have quite a number of smaller vignettes that friends have printed from plates over the years. I'll share them here and I'd like to welcome anyone else who has something like this to post here, as well. 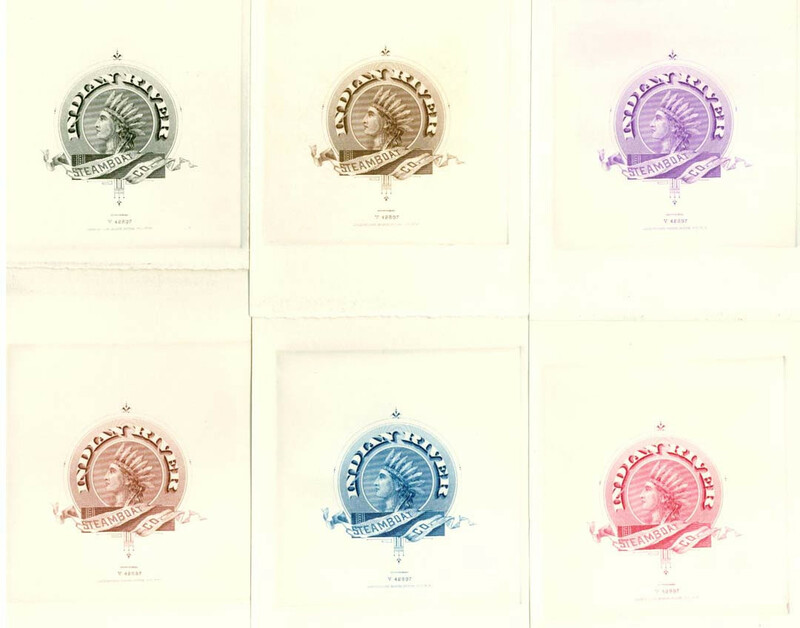 Here's my ABNC plate and a variety of color prints from it. My favorite was the red brown. Very cool engraved prints. Lucky you. 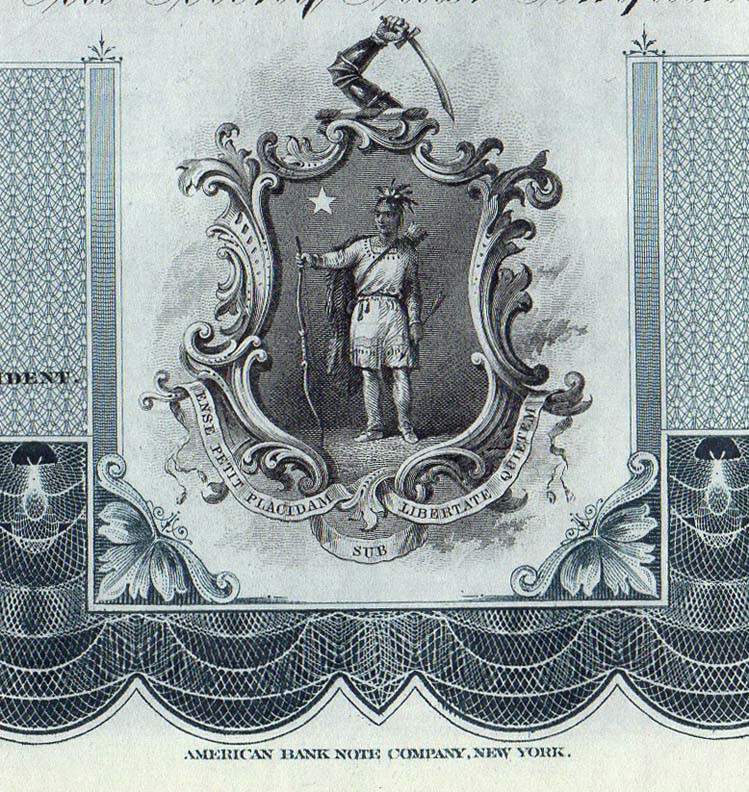 Here are three more privately printed banknote engravings. You can actually see the die impression marks on these. 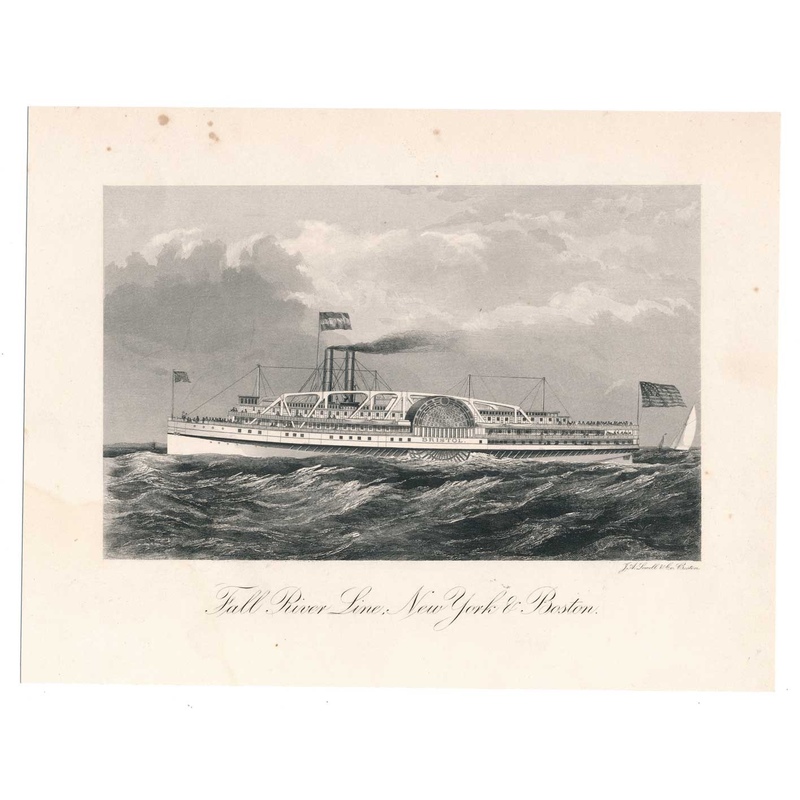 Btw, the ship is the SS Bristol, which ran the Fall River Line out of New York, from 1867 to 1888 -- very lavish vessel. Those are some very cool engravings. I really like the one of the SS Bristol. 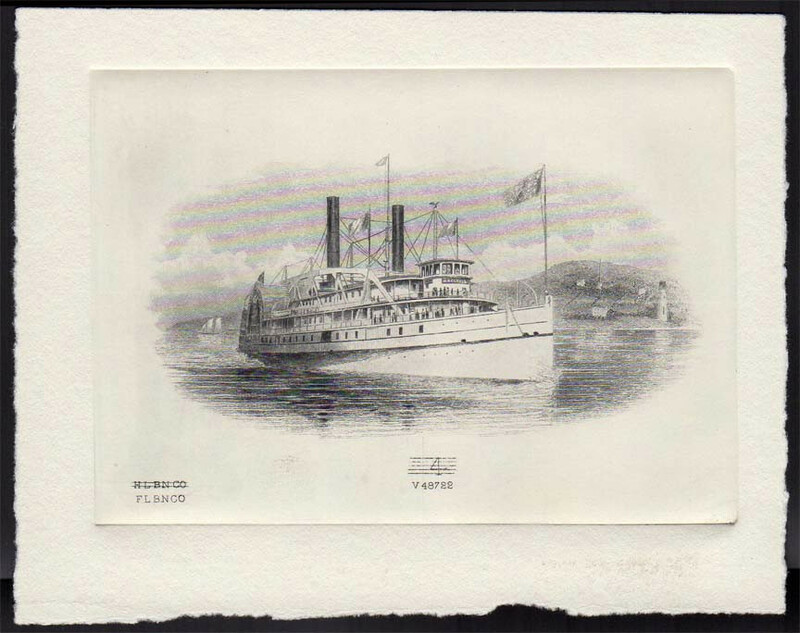 The view of the Bristol was modeled from an old stereocard. When you flip the image everything lines up, even the flags. 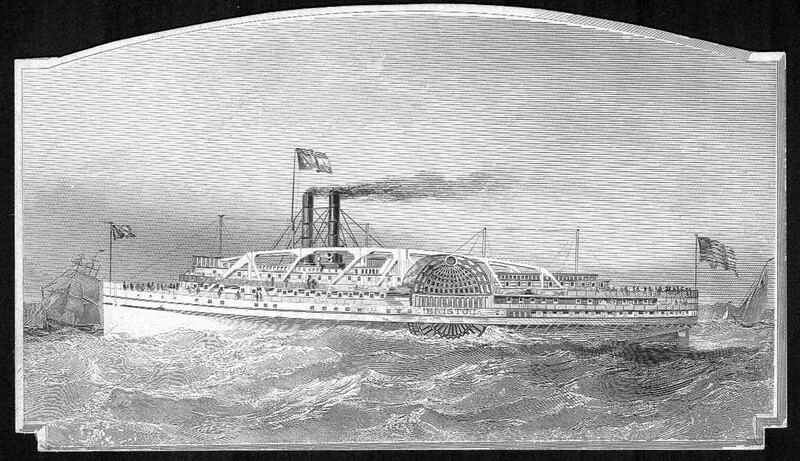 Except that the Bristol was actually docked and the engraver decided to add some people on the decks. 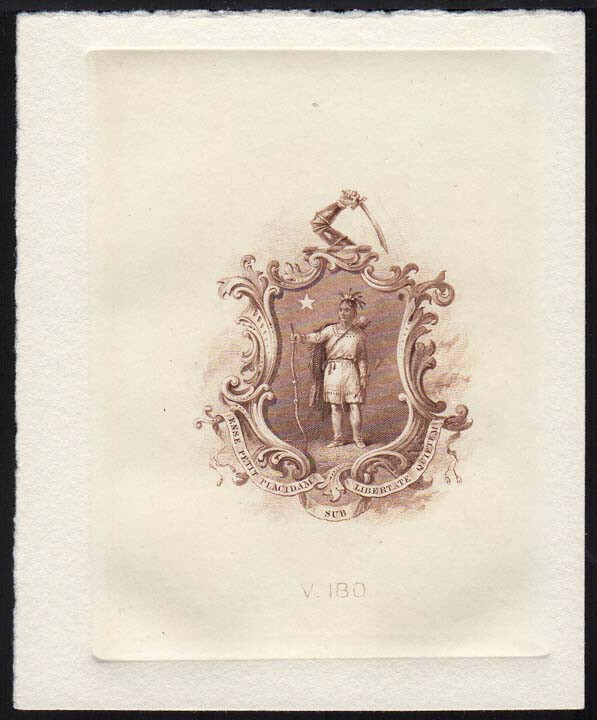 Here's a private print of a little state seal of Massachusetts from a plate by American Bank Note Co. 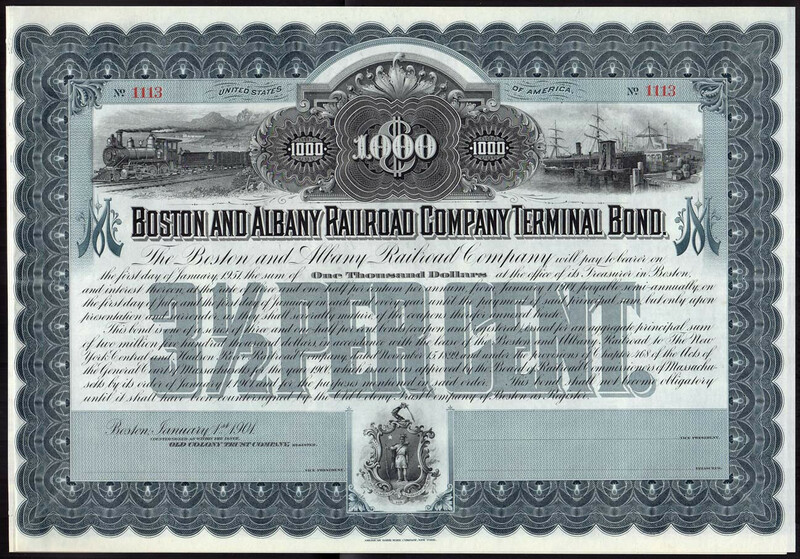 I was able to trace it to a matching Boston & Albany Railroad bond. 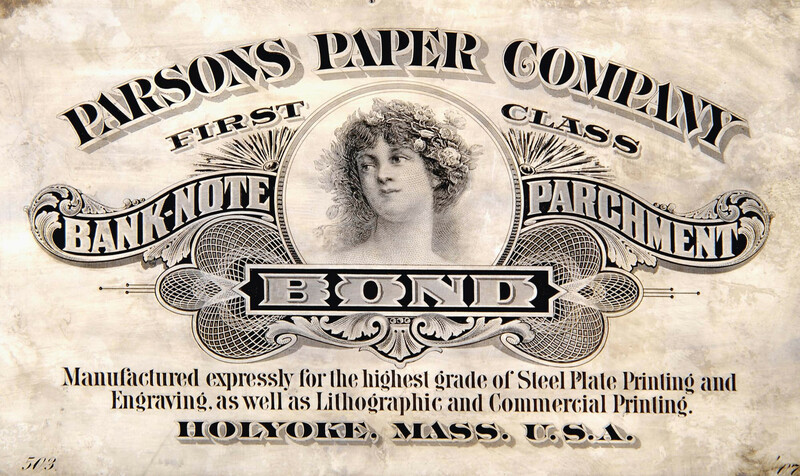 The Parsons Paper Company was founded in Holyoke, Massachusetts in 1853 by Joseph Clark Parsons. The firm merged with National Vulcanized Fiber Co. After nearly disbanding during the depression, the firm spent World War II producing invasion currency for the allied forces. The firm went bankrupt in 2005. I consider the piece illustrated an advertising note and have included a similar one with black ink in "The Catalog of Printers' Test Notes", now in it's 14th Edition. The known black ink note (PPC-112a) is 101.5 mm x 165 mm, definitely used, and sold at auction for $1,300! Here is another view of the Bristol. Quite an interesting design! Very informative post! I'm almost certain that my version was printed from a plate purchased at one of the many auctions of American Bank Note Archives material around 15 years ago. And I would bet that the original printing plate went for much less than $1,300! I was just corresponding with someone yesterday regarding The Catalog of Printers' Test Notes. I really need to get a copy. I'm not as interested in the modern notes, but the 19th and 20th century pieces are quite fascinating. I'd be very interested in seeing the advertising "notes" from ABNC and its predecessors. Are you the author/editor? Yes, the Bristol was quite popular with engravers. 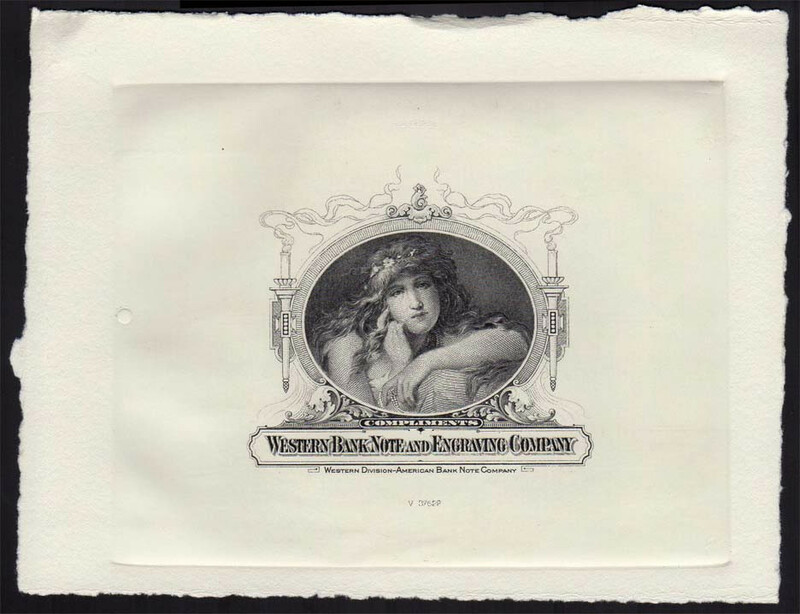 I have a BEP proof, a trimmed down engraving (perhaps from a calendar), and she also appears on a souvenir card issued by the Washington Chapter of the SCCS. All of these look similar but they are all separate engravings, which leads me to believe there is a painting that the engravers used as the model. 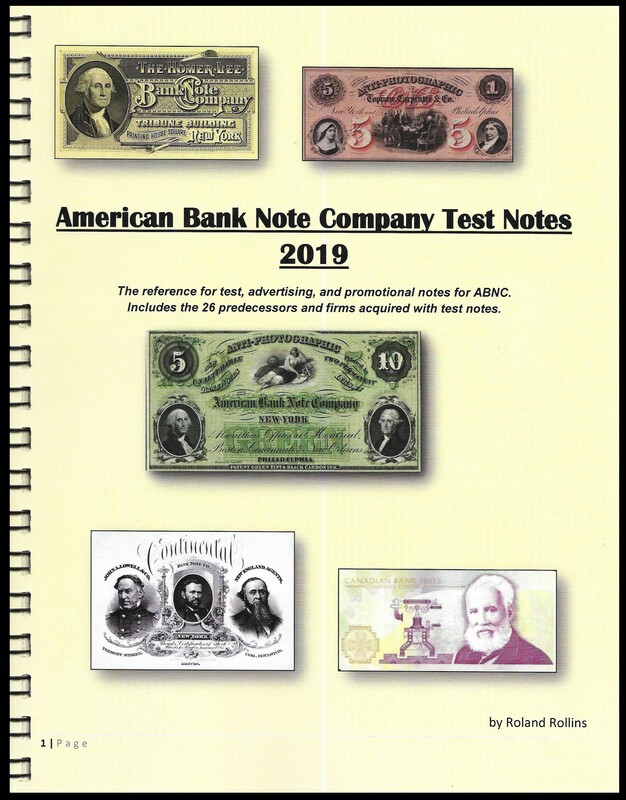 Yes, I am the author of 3 test note catalogs: The Catalog of ATM Test Notes (11th Ed), The Catalog of Printers' Test Notes (14th Ed) and The American Bank Note Test Notes (1st Ed). The first two are available as eBook pdf files only - too costly to print in color! ATM 500+ pages, Printer 800+ pages. The Printer catalog has 3962 color images, 1701 notes - 2845 notes if you count the variants, and 209 test note issuing firms. There are a good amount of early English and American notes. Most would be called advertising or color samples. Either eBook is $30 with no shipping fee if downloaded. The ABNC book covers all 146 known advertising notes of ABNC and the 114 advertising notes from 26 predecessors or acquired firms. The 86 page all color book is spiral bound with 65# white laser glossy paper cover to allow laying book on flat surface. This book is $25 with $3 USPS media mail shipping. I've added the cover & 1st page of ABNC to peruse over. Some folks prefer a book they can take to an easy chair and some folks like to be able to do searches with a few clicks of the keyboard. Oh, I like the look of that ABNC book, Roland! Does it also include adverts that ABNC did for other companies like Parsons? There is a topic on the forum devoted to Test Notes -- you should post something about the books there. http://www.papermoneyforum.com/post/anyone-collect-test-notes-8298855?highlight=test+notesπd=1300007141 And you'll find other related topics if you do a search. 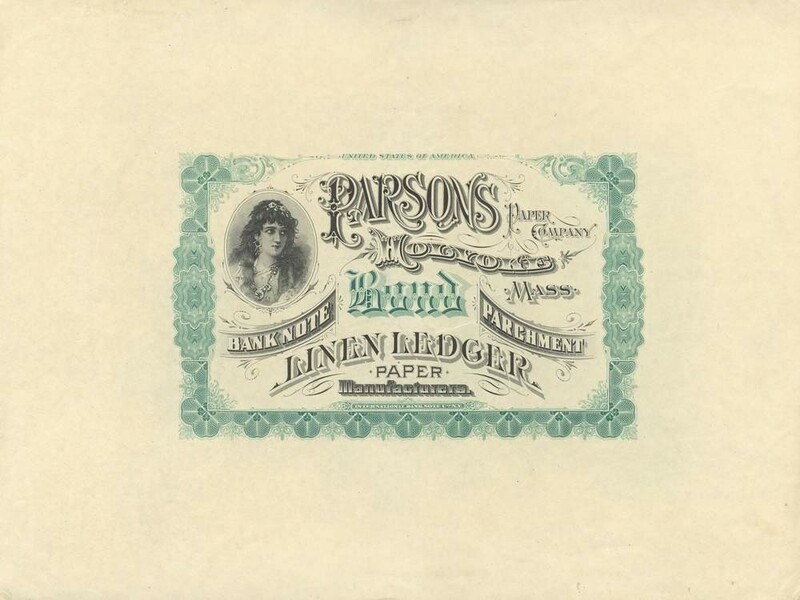 Parsons Paper Company. Steel. 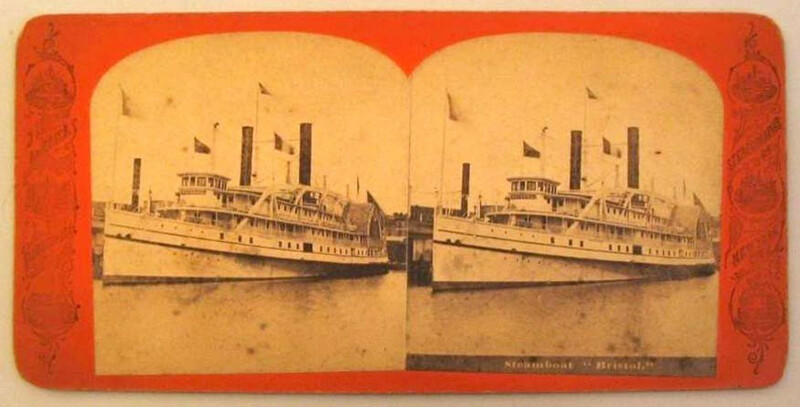 6.5 x 4 inches. Medium pewter gray with areas of deep brown and violet toning, mostly toward the edges, and light olive overtones over much of the plate. 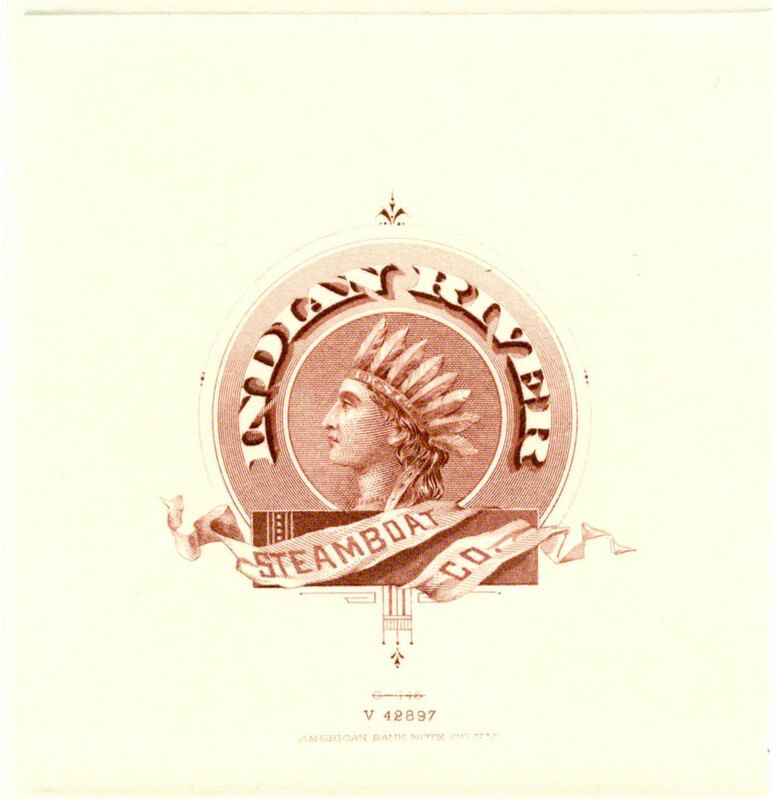 A large advertising piece giving the titles and promotional language relating to the company's paper products, with specific mention of the high quality papers "Manufactured expressly for the highest grade of Steel Plate Printing and Engraving as well as Lithographic and Commercial Printing." A lovely female portrait at center, with engine turned security engraving around. There is a topic on the forum devoted to Test Notes -- you should post something about the books there. 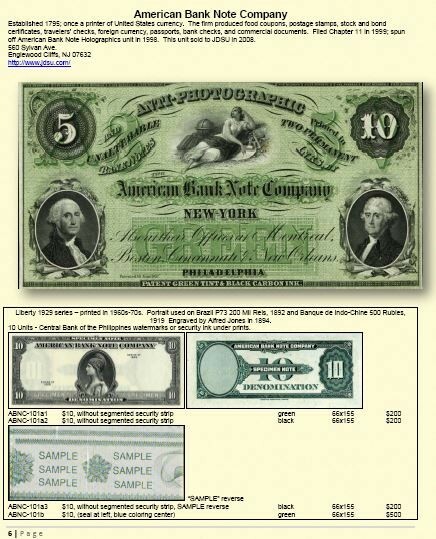 http://www.papermoneyforum.com/post/anyone-collect-test-notes-8298855?highlight=test+notes&pid=1300007141 And you'll find other related topics if you do a search. 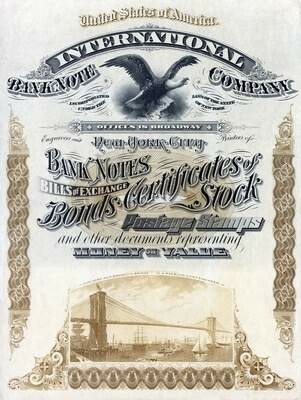 Since the International Banknote Company was absorbed by ABNC in 1905, the IBC ad note with suspension bridge at bottom is included in the catalog. 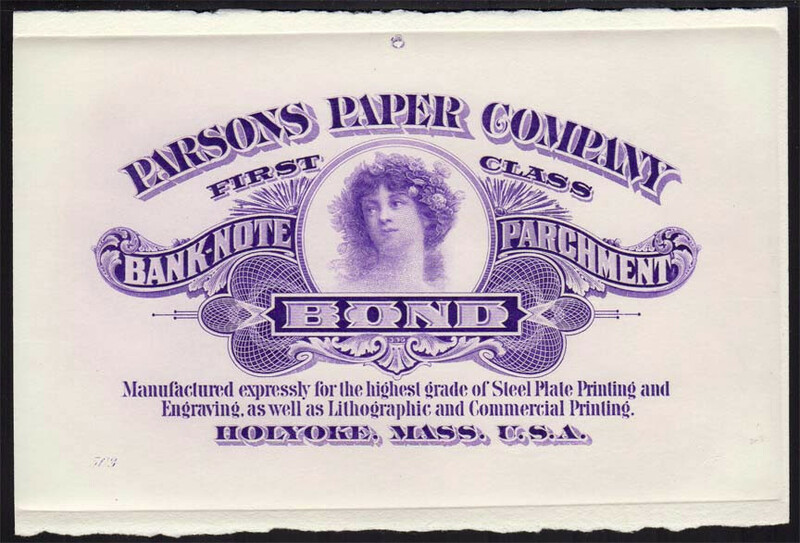 The reverse of this note is a Parsons ad. When notes have more than one firm printed on them, they are given dual catalog numbers. This one is IBNC-101D and PPC-102aD. 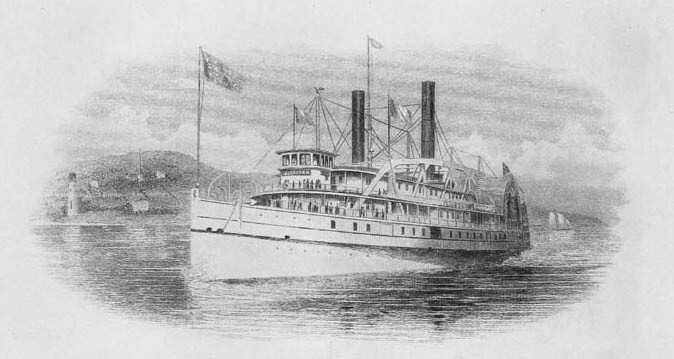 The "D" indicates the dual listing.